Master the brackets and score for your company by attending our 2019 Employment Law Symposium. It’s March Madness, HR style! 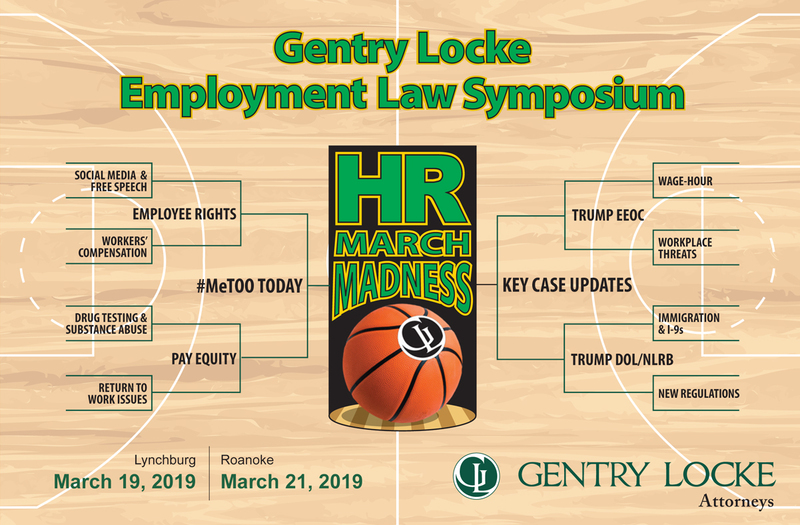 Gentry Locke’s Employment Law attorneys will help you fill out your employment law brackets so you can successfully advance and WIN for your company. Register now to get a courtside seat for this full day of action! Professional Credits: As a SHRM Recertification Provider, Gentry Locke is recognized by SHRM to offer 5.5 hours of Professional Development Credits (PDCs) for the SHRM-CPSM or SHRM-SCPSM for this day of programming. Additionally, this activity has met HR Certification Institute’s® (HRCI®) criteria for 5.5 HR (General) recertification credit hours toward aPHR™, PHR®, PHRca®, SPHR®, GPHR®, PHRi™ and SPHRi™ recertification. Register by March 15: $195/attendee includes a Continental breakfast at sign-in, lunch, and all materials. Refunds: Our policy is to allow the switching of attendees or event locations if needed. Full refunds will be made by check if cancelled no less than two weeks prior to the event date. All refunds will be made by check, no matter how the registration was paid. Questions? Email glrm@gentrylocke.com, we’re glad to help! 1:00-1:30 – One Shining Moment Get out your foam fingers, fans! We’ll play fast & furious to see who really knows their employment law facts in HR March Madness Survivor.